Those daft pirates are still at it and now there are even more of them! 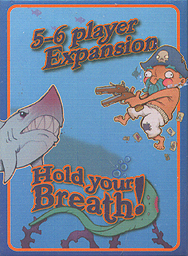 It looks like you're not the only pirate to survive walking the plank and manage to out swim that shark who tried to take a bite out of you. Now let's see if you can "Hold Your Breath!" the longest in this press your luck game of nautical fun! Add these cards to your existing game of "Hold Your Breath!" so you can play with 5 or 6 players.